"Cut-paper illustrations trace this educational tale of a bunny family's outing to an orchard and its aftermath. Wallace shoehorns in useful information on apple culture, from selected varieties and their uses to planting, grafting, and proper picking technique. Readers learn that the apple is actually a member of the rose family and discover the parts of an apple when the farmer cuts one in half. Later, when the bunny family of four return home, they are treated to applesauce (the recipe, with step-by-step illustrations, is included). 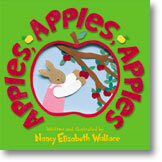 Also included are instructions for making apple prints, a list of apple maxims, and an apple song. Wallace's artwork excels in the instructional sections, with clear labels of the proceedings, and a lively spread of the orchard."